So, building has been completed on the ASLAV, the weather has cleared enough for me to undercoat ASLAV today, so paint should start tomorrow (all going well). Another thing that which was missing from the kit was the ammo box for the pintle mounted FN MAG 58, so I whipped one up from some Green Stuff. I think that is all the building I am going to do, I could keep covering it in kit, but I do like the Australian vehicle camo, so I want to keep plenty of flat panels for the camo scheme. 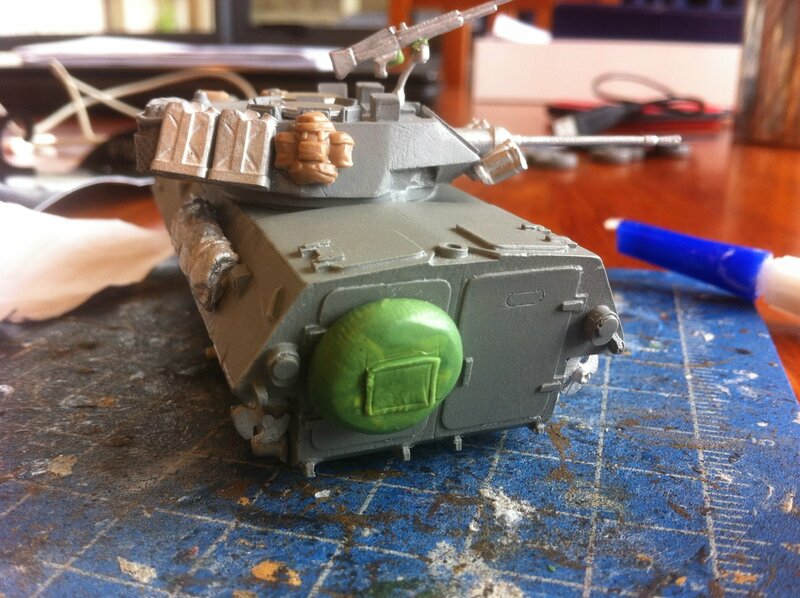 So, off to undercoat the ASLAV, hoping to get the paint on it tomorrow. Sorry for the lack of posting, in short I have become very heavily involved with Skirmish Sangin, which is taking up most of the mental capacity I have for writing, leaving very little enthusiasm for posting stuff up here. 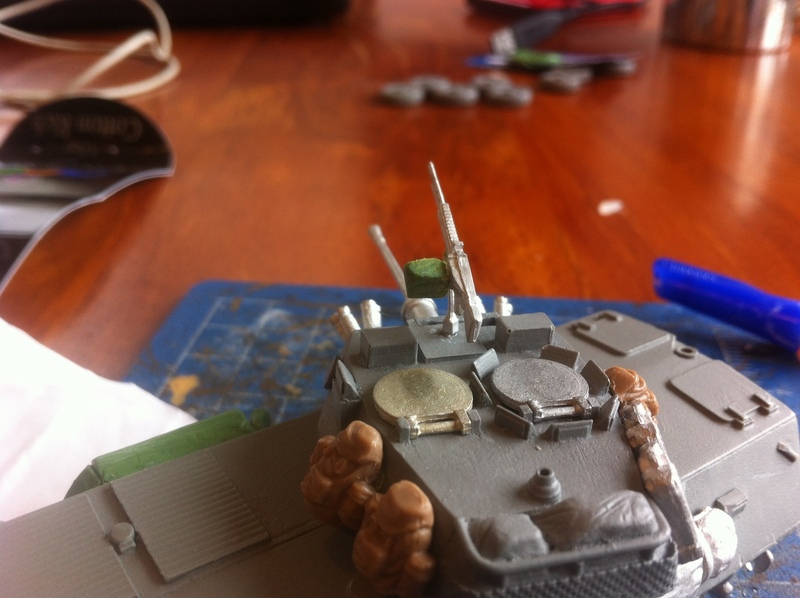 This is a first WIP look at my current project, an ASLAV (Australian LAV-25) in 28mm. The initial model comes from Imprint, and I have added my own modifications to it. The primary difference from the Imprint Kit and the ASLAV is the exhaust, which I resculpted from Greenstuff and a bit of hacksawing. It was really the main problem, and took far longer than I had expected to sculpt (straight edges are not my forte). I am happy with how it looks currently. 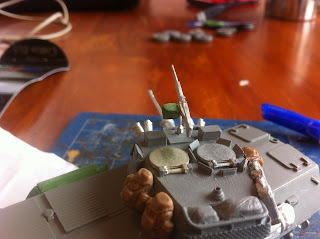 Other additions are medical tape camo net on the front of the vehicle,backpacks from the Airfix 1/48th plastic Modern British Infantry and jerry cans on the turret. Once the Green Stuff has dried, I will get some paint onto it, hoping to have it done by the end of the week, so keep looking out. My force of Guards Tankovy works out as.. I chose again to use my winterwash technique using the sponges out of blister packs, and quickly worked up my force. 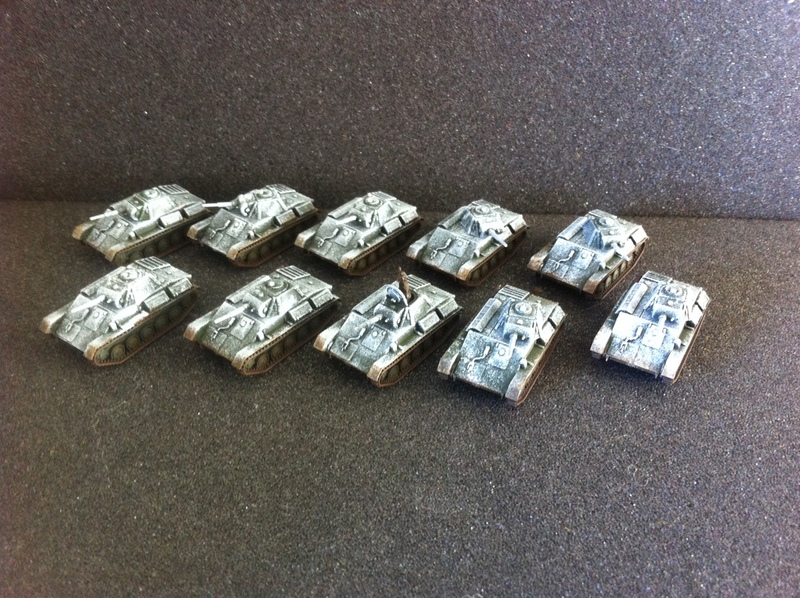 10 Plastic Soldier Company T-70s. I was really impressed with these, and plan to write something up about them in the future. Another tournament special thing is that in some rounds, we may get air support. So, I picked up a cheap plastic Zvezda LaGG-3 fighter- mainly so I can complain about lag if it doesn't come in! 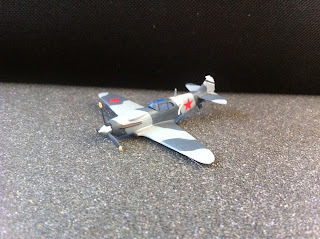 The colour scheme has been taken straight from Google- this is the paint scheme on a LaGG fighter on display in Moscow. And conveniently, it works perfectly with my Winterwash colour scheme! So there it is, a quick little update, I plan to do an AAR following the tournament. Big question, will I lose more than 31 tanks? So, as part of the Analogue Challenge I set myself the goal of finishing some of the many projects which I have purchased, and then not done a single thing with. 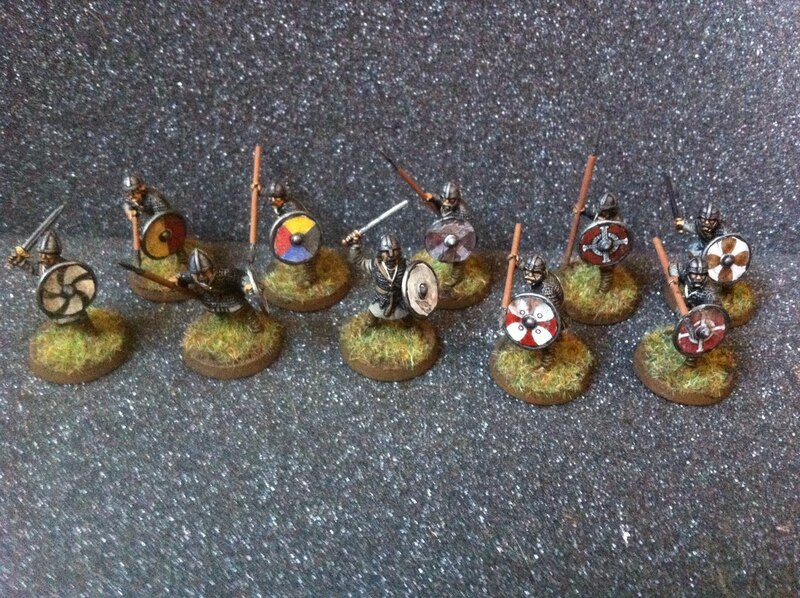 The first of these, is an Anglo Saxon warband for SAGA. I bought this when I bought my Irish Warband, so roughly a year and a half ago. All that it was used for in that time was for spare pieces, being repeatedly raided for weapons, heads and anything else that I thought might be useful. With SAGA starting to become popular here, there are about 3-4 warbands which I know are on people's painting tables (right Tim? 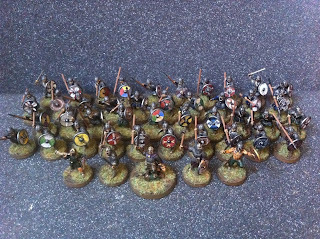 ), I thought it was about time for me to get these guys out and painted. 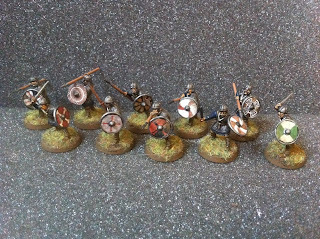 To help inspire me to paint them, I decided to use Little Big Men Studios shields, because from seeing Kent's gorgeous Carthaginians I knew that the transfers would really make my Saxons "pop". 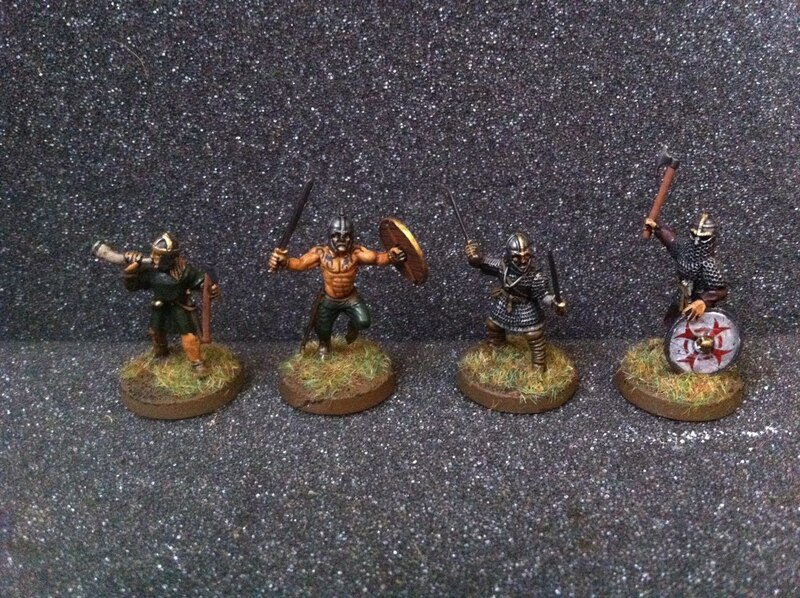 So, here we are, all six points of the Warband. 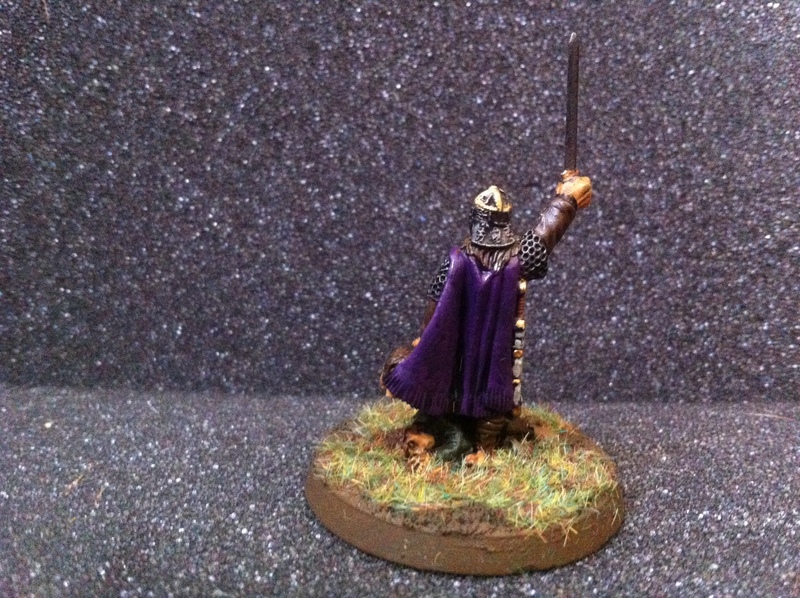 Starting with the Warlord, he is a Gripping Beast metal miniature, looking rather dapper in his purple cloak. 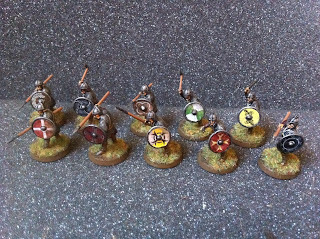 The first point is a unit of four Hearthguard. 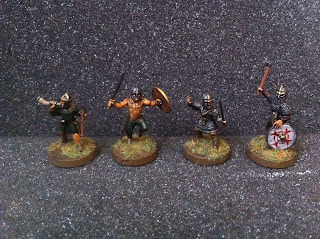 Two are metals from Gripping Beast, the one with two swords is a Gripping Beast plastic, and the fourth is a Warlord Games Celt, with some GB plastic parts. 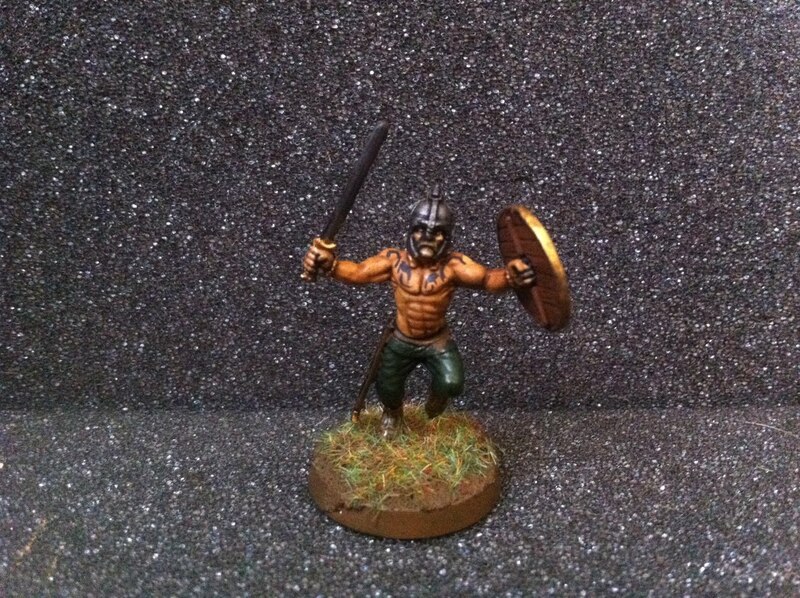 I am particularly happy with the tattoos on the Celt, that success was what actually inspired me to paint up a whole army of Impetus Celts! 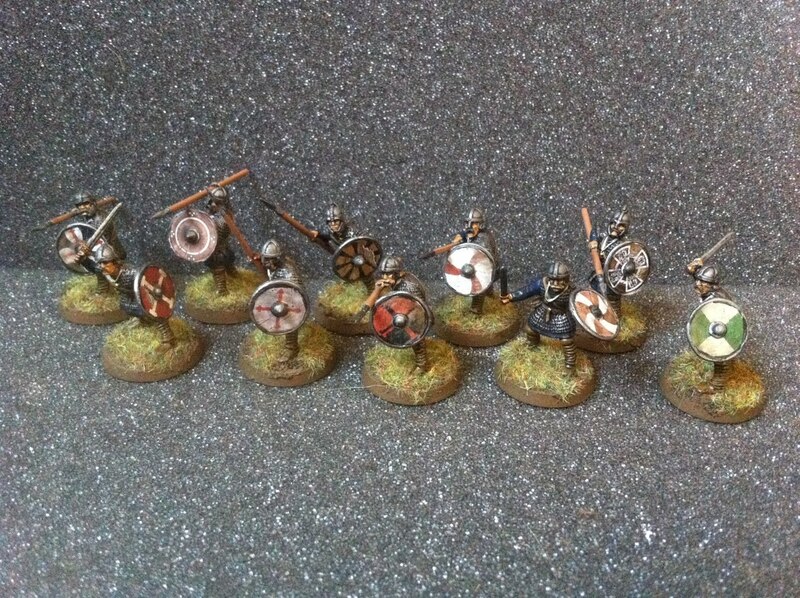 The rest of the Warband is made up of four units of 10 Warriors. 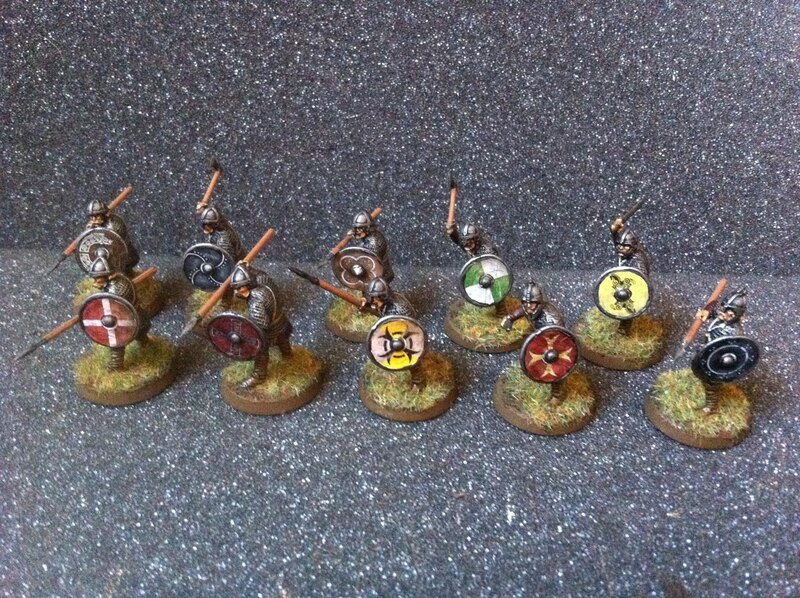 These are all Gripping Beast plastics, with Little Big Men Studios shield decals. The first (of many) old projects finished! 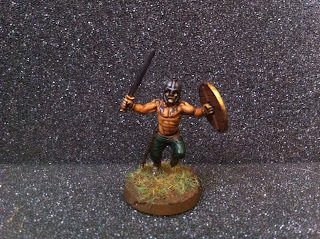 Back to the painting table, I will keep updating here with more of the painting. 2013- It has been a long time coming! Well, after a good month plus of a hiatus (unannounced of course), I figured I would put something up here, just to remind you all that I am still kicking around! 2012 ended on an insanely busy note. I moved cities, and began working on the Analogue Painting Challenge. It has taken a fair while to sort through the mountains of boxes, and certainly most of my gaming stuff is still in a box, but I am settled in! The new city has opened up new opportunities, I have been encouraging the new locals into a variety of my favourite games- Impetus, SAGA and Force on Force. Thankfully, there are more than a few locals who were already keen on them, so we are well on the way! My painting has been trucking along really well, actually as it stands I am in the lead in the competition! Well, a 20 point lead, but a lead is a lead! But I will do big picture dumps of that soon. The plan for 2013 then? -Day of Days Nick and I are running some Soviets, by some, I mean a whole lot! My side of the army is already done, but more on them in the future. -Nationals Although it is in Wellington this year, I just can't get excited about 3 days of Flames of War. There are some cool late war lists which I could run, but I can barely justify 3 days of gaming, and if I am not going to enjoy it... On the other hand, the locals enjoy the fantasy game Malifaux, which has a 1 day competition, which is altogether more tempting. 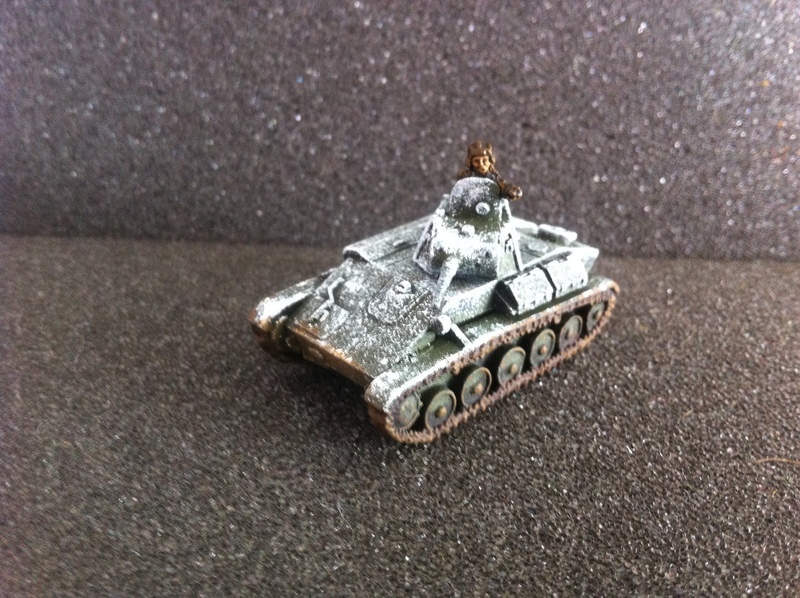 -Southcon For something new this year, Southcon are running an Impetvs competition, based loosely around Far Eastern armies. With EI 5 just coming out filled with cool eastern lists, it made total sense! There are plenty of armies being planned, and my idea is to run Ikko Ikki, an army of peasants! But more on those when I see the lists, and make some plans. -Call to Arms The grand plan here? 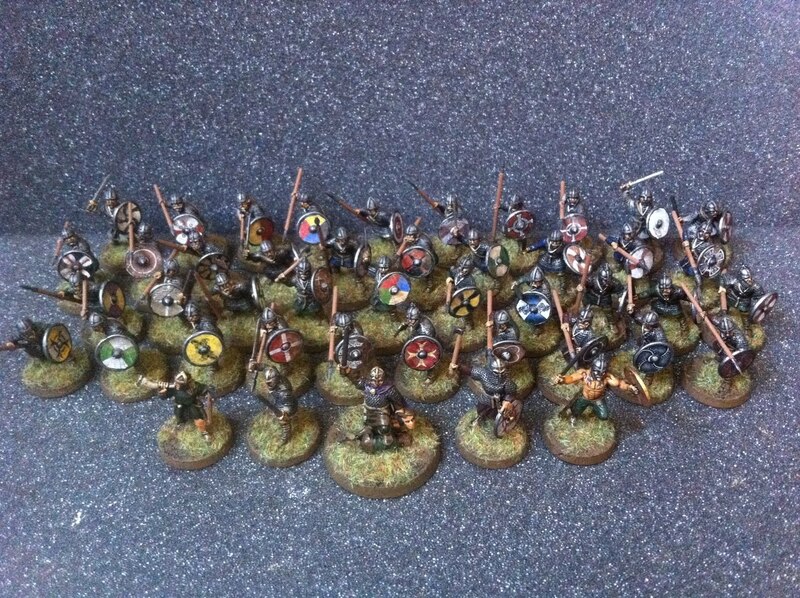 A group of us have gotten together and have decided to refight the Day of the Rangers in 28mm. 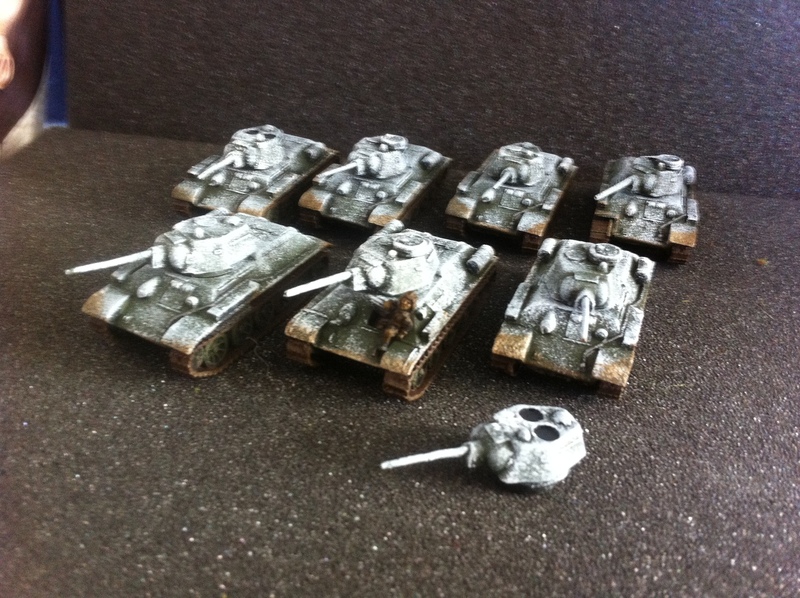 So what that means, is I am going to pick up and paint some sweet as 28mm US Moderns! On that too, I am having a game of Skirmish Sangin, which is a set of rules from a local company, will be interesting to see it in action! Plus Conquest probably and that will likely round out my tournaments for the year! So what else is on the plan? ACW- The Gettysburg Refight is this year, and I need to get painting! Oh, and a whole host of Flames of War too! A bit of a cop out post I know, but it is to try to get me back into the habit of blogging as well as posting pictures to Analogue! Adam and I managed to find time to have a game of SAGA last night (not that hard, SAGA doesn't exactly take long for us). The Brave and dashingly handsome Irish were fighting the ruthless, cold, kitten killing and generally bad guys, the Rus. The Irish were hanging in their village, tending their crops, telling stories of their greatness and downing an ale or two, before the a messenger of the oppressive land owners arrived, demanding their due. Screaming something about taxation and representation, the Irish dutifully sent that messenger back headless. Apparently that was not payment enough, so it was not long before the Rus arrived.. 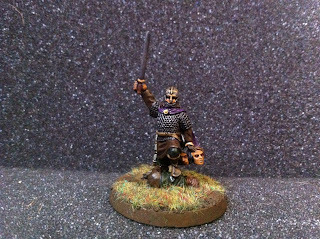 The Warlord Fionúir emerged from his castle, ready to do battle. The Rus advanced relentlessly towards the Irish, but much to their suprise, the Irish sallied forth from their walls, and sought combat! So much for a walk over! The Irish ran forward, throwing Javelins at the oncoming Rus. In spite of a ridiculous number of projectiles, no one died. Not even a scratch. Loki was pulling the wool over the Irish eyes! There are meant to be less of them! The Levies needless to say did not last long. They killed one of the enemy, but were not spared. Then the enemy levies sought combat with the brave Irish boys.. In the centre, Fionúir surrounded by his loyal wolfhounds was ambushed first by enemy warriors, who sacrificed three of their number to roll an astronomical 20 attack dice! The cunning Rus had sought to isolate Fionúir, for without his loyal hounds he was easy picking for the heavy axes of the enemy Varangians. 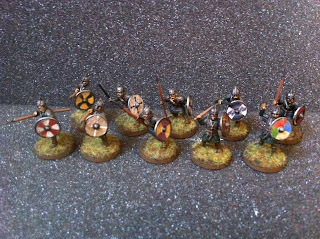 But the Varangians themselves were then ambushed by yet another unit of warriors (I have a few), who pelted them with their javelins. This time, the missiles had an effect, killing almost all of the number. 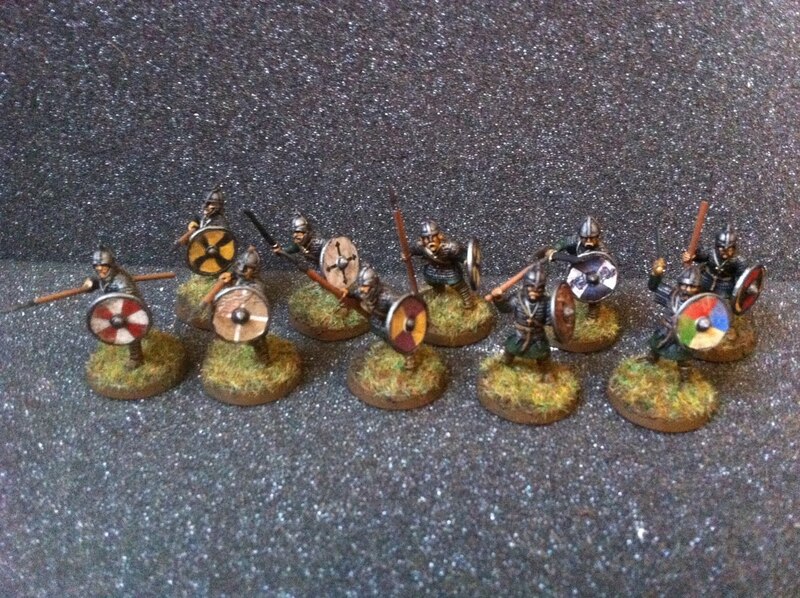 The last Varangian was killed trying to avenge the death of his brother in close assault with the Warriors. 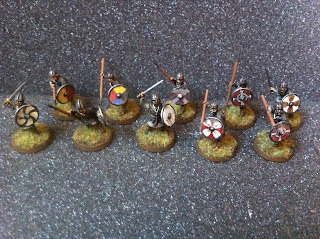 But then those warriors were ambushed by the enemy Warlord and some more Varangians, the mutual destruction leaving just two men standing before the gates of the village. The game ended shortly thereafter, when that lone warrior rolled many, many 6's on a dice to give himself a lot of Javelin dice, then proceeded to throw them all at the enemy Warlord. One missile was enough to cause a fatal wound, saving the village! Was a fun game of SAGA, something very different! It was good to play SAGA after so long, the Irish were getting very bored sitting in a box without a game! Right, painting challenge is all go, I need to get cracking. Moderns game Saturday, which will be awesome.